West Ranch Stock Market Gamers Place No. 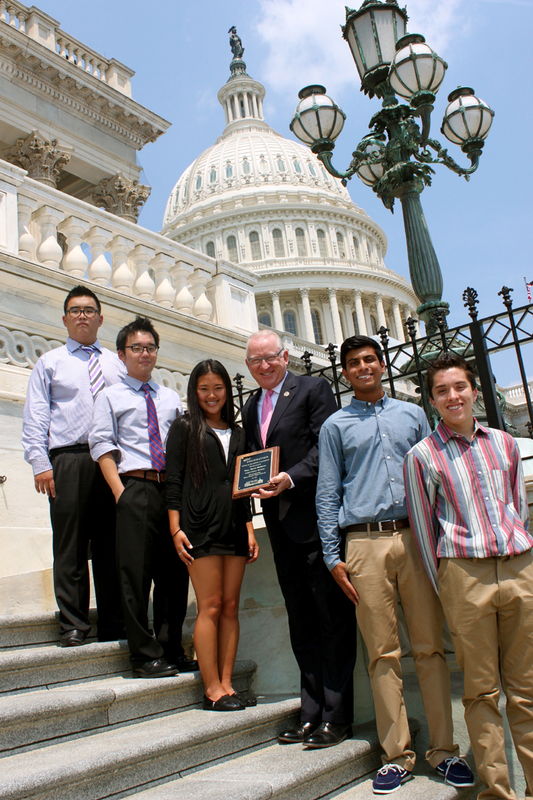 3 in U.S.
[Rep. McKeon] – U.S. Rep. Howard “Buck” McKeon welcomed a group of students from West Ranch High School in Santa Clarita to the Capitol on Thursday to celebrate their exemplary third-place showing in the 2012 National Capitol Hill Challenge Stock Market Game. The Capitol Hill Challenge is open to high school students across the country where students participate in the Stock Market Game over a 14-week period. The competition uses the curriculum-based Stock Market Game, a program of the SIFMA Foundation for Investor Education, to help students develop math, economic, and research skills associated with long-term saving and investing. It also helps them understand how the capital markets work. Over the course of the competition, teams of three to five students at more than 200 schools across the country each invested a hypothetical $100,000 portfolio in real-world stocks, bonds and mutual funds. The five teams with the highest return on their portfolio won a trip to Washington, D.C.
West Ranch Senior is Group's Teen Leader for Western U.S.